Just tried out the Gurin compact dehumidifier and I am really impressed with it. It’s a small compact size and takes up little space. It’s perfect for a small room. I actually got this for our lake cabin (it has two small rooms). Of course being by a lake we have problems with the humidity there so I wanted something to try to draw some of it out. I set up one in the mail cabin room and one in the bathroom. It worked really well. I would say better in the bathroom though then the main cabin room. In the bathroom it collected about 1/2 to 3/4 a cup of water each day. In the main cabin it was more like 1/4 to 1/2 a cup. It is super quiet which I like. You hear a light fan noise, but it’s barely noticeable. Large water chamber to collect the water. Easy to clean as well. It comes with a power cord to plug it into a regular outlet. My complaint is that for some reason when I turn it on I have trouble getting it to start, I have to jiggle the drawer around until it triggers it to turn on. It’s somewhat frustrating. Not sure why it does that. Other then that I like it. 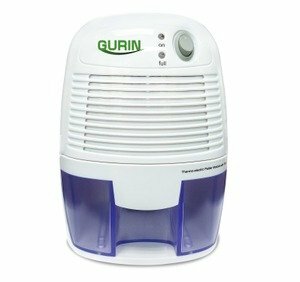 Please refer User Manual under Product DetailsThe Gurin Electric Compact Dehumidifier uses Peltier Technology (no compressor) which makes it light and quiet. It is perfect for bathrooms, and small to mid-sized rooms where dampness and humidity are a problem. This unit is small enough to easily fit on your desk or workbench. It extracts the moisture from the air and stores it in a spill-proof reservoir. Just plug it in and it quietly dries the air. Features an automatic shut off switch to shut the unit off when the water reservoir is full. When this occurs a”full” indicator light will alert you when the reservoir needs to be emptied. Holds up to 16 oz. CE and UL Approved.